Do you have a line level source (TV audio, MP3 player, video game etc) which simply isn't loud enough? One that forces you to crank up your receiver or amp volume control, simply to match your other sources? Or perhaps you need to run a long line between your TV audio line out and your receiver on the other side of the room, but find too much level is lost, or worse, interference from hum or a radio station is induced. This product is the fix. The TC-780LC provides up to 20dB of gain with any line level source, allowing longer cable runs or that "bump" you need to cure low volume issues. 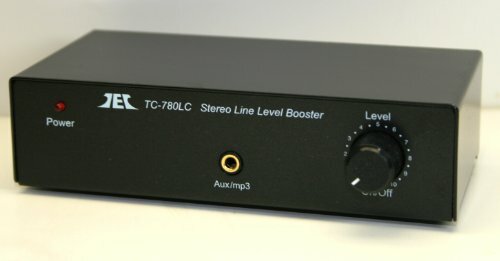 Used in series following one of our phono preamps (see the middle illustration in the connection diagram image), the TC-780LC can be used to compensate for low output phono cartridges (B&O MMC series owners, take note! ), so that you don't have to crank the volume every time you play a record. Or you can use it to add a volume control between a line level source and a power amp which has no level adjustment of its own. The 5-pin DIN in/out jacks match those found on older European brands including Bang & Olufsen, Tandberg and Revox, while the RCA jacks match virtually everything else. Connecting to the front panel miniplug jack automatically bypasses the rear inputs, allowing temporary hookup of iPods and MP3 players for listening or recording. Again, you are purchasing the BLACK VERSION. To find the silver version, enter B004RYMYUO in the Amazon search bar. We include free of charge a stereo patch cord (for connection to a receiver or minisystem) and a mini-plug adaptor for use with computers. This model now includes our new universal voltage SMPS regulated AC adaptor usable anywhere in the world (see the images for details). If you have any questions about this product by Phono Preamps, contact us by completing and submitting the form below. If you are looking for a specif part number, please include it with your message.